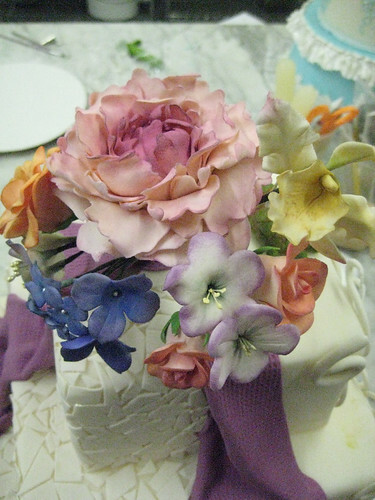 I promised I would write something about my experience in Colette Peter’s cake decorating class at the Notter School of Pastry Arts. So, here’s my experience! I arrived in stormy, rainy Orlando, Florida on Sunday November 30th. After jumping on a bus and arriving at my hotel (the Crestwood Inn and Suites), I was slightly annoyed. My flight was long, the bus ride was disorienting, and there are virtually ZERO sidewalks in Orlando. So, carrying my bag the .8 miles to the hotel was a bit tiring. After resting at the hotel for a bit, I headed out, printed directions in hand, to the Notter School. Surprisingly, it was easy to find. Since that mission was accomplished, I then walked around the Florida Mall, then got bored, and went to TGI Fridays for some din-din. The people at TGI Fridays were very nice, and the Sam Adams Winter Lager that I had was especially tasty. I then meandered back to my hotel, walking past the Publix distribution center, as well as a Sherwin-Williams factory. Truly, I was in a quality neighbourhood. It was only on my final day in Florida that I realised how quality: the barista at Barnie’s informed me that the OBT (Orange Blossom Trail, the main road in the area) was frequented by miscreants, the homeless, and random prostitutes. If I ever go back to the Notter School (or if anyone reading this has any inclination to go), please be wary of where you stay, and who is around you at night. Anyways, back to my experience. On the first day of class I arrived a bit early to do some paperwork, get situated, etc. 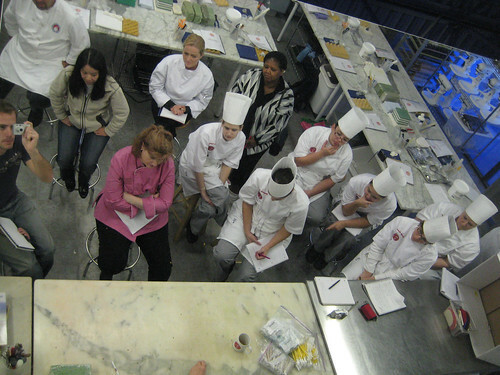 I arrived at 7:30, and already several students (the students who were fully enrolled at the pastry school) were already there. A few others filed in slowly. Colette Peters was there, ready to get started. The woman in left centre was probably the most interesting person that I met (though everyone was interesting in their own way). She’s got some incredible photos of cakes on her website, and if I am ever in Nova Scotia, I will be going to her for some cake, and for her family’s restaurant. Check it out here. Since I’ve done some gumpaste work before, I took some time to make some extra flowers, and also made some little critters. Over time, I assembled quite a few little animals, and even some accessories, including presents, bubbles, a cheese wedge, and some cinnamon rolls. I was able to add them to one of my final cakes on the third day. The photo is below. 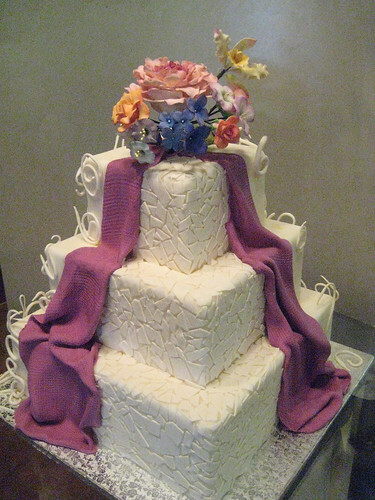 On the third and final day of class, Colette demonstrated how to use fondant; how to roll it out, drape it over a cake, and how to use it on dummy cakes (styrofoam boxes or circles), etc. She also quickly demonstrated crimping, embossing, and painting with luster dust. Whoo…..
And finally, I quickly assembled a mosaic, roman-emperor style on the opposite side of my critters and curls cake. Unfortunately, I didn’t think to trim the curls off so that you couldn’t see them, but… the class was ending, and I was running out of time. Anyways, I think you get the idea! 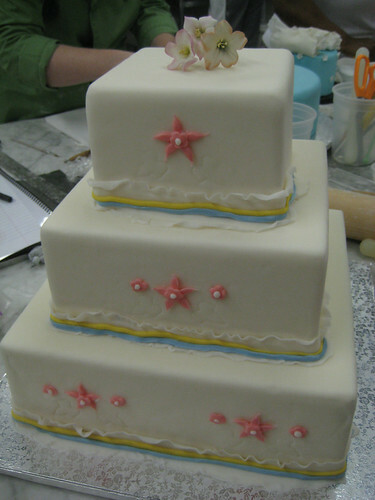 So, that was Colette Peter’s cake decorating class! Did she cover everything? No. We never learned the oriental peony, or ivy. 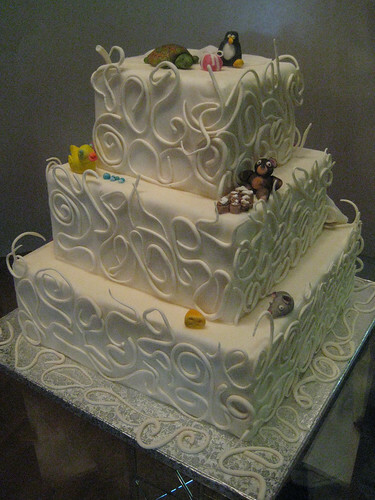 Did we do any piping or buttercream work? No, unfortunately. I wish we would have. Did we cover everything the Notter School said we would? No. And what we did cover was only covered very briefly. Was it worth the $820? Err…..
Did I enjoy meeting Colette and learning from her? YES! Did I have a great time? YES!! Would I do it again? YES, but…. I need to save a lot more money before it happens again. At least now I can say I’ve been to Florida, I’ve been to a culinary school, and I’ve met one of the most famous and talented cake decorators in the country. Now if she would just hire me!!! =) knock on wood and keep your toes and fingers crossed for me! Your blog is great! thanks for commenting so I could find it! I wish I could take some more classes in sugar work. I like your flowers. Fantastic looking cakes! Thanks! The class was a lot of fun, and I hope to go to more. I really enjoy your blog. The photos you take are AMAZING. Can’t wait to try some of your recipes, too! I just found your blog and I am addicted! Well, keep coming back, I will surely feed the addiction! Thanks! I had a fun (but brief) time at Notter. Before I went there, I read a lot of Su Yin’s blog (in my blog roll) to get an idea of what to expect. I wish I had stumbled on your blog before too! I distinctly remember the Madagascar cake. Well done! How is Notter now?